VegiWorks, a San Francisco and San Jose produce delivery service, has seen the surest sign of spring: asparagus is popping up everywhere. VegiWorks celebrates springtime with fresh asparagus. As Tennyson almost said, in the spring a young man's fancy lightly turns to thoughts of asparagus. As the tender shoots emerge from the soil to greet the sun, San Francisco produce delivery service VegiWorks brings the asparagus from the farm to the chefs and grocers eager to celebrate the beginning of spring. “Asparagus is known as the harbinger of spring, and it is sprouting up all over the place. Everyone we talk to is thrilled that asparagus season has finally come, because it’s such a versatile vegetable. In soups or salads, with fish or chicken, or just grilled and topped with lemon and butter, asparagus is one of the most beloved veggies out there", said Bob Mametsuka of VegiWorks. VegiWorks points out that not only is asparagus tasty, it’s also highly nutritious. 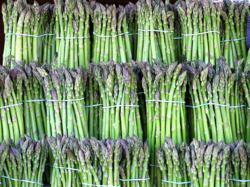 Asparagus is rich in vitamin K, vitamin A, folate, iron and vitamin B1. According to the World’s Healthiest Foods, it has anti-inflammatory and antioxidant properties, supports healthy digestion, lowers risk of heart disease and diabetes, and reduces risk of some cancers. Asparagus has been cultivated as food and medicine for over 2,500 years, from the ancient Egyptians to modern people across the globe. California is by far the biggest grower of asparagus in the US, with 52% of production happening in the Golden State. Asparagus is a major crop for California, ranking number 49 on the most recent agricultural commodities ratings. VegiWorks, a leading supplier of both conventional and organic produce in the San Francisco Bay Area, has close relationships with numerous suppliers throughout the state, and offers several varieties of asparagus, from standard size to jumbo, in green or white. For more information about asparagus, or for information about any of VegiWorks’ products or services, call (415) 658-9219, visit http://www.vegiworks.com, or find VegiWorks at the San Francisco Wholesale Produce Market, located at 1910 Jerrold Avenue in Bayview.